From the moment you step into our consignment furniture store, you’ll notice the difference. Our friendly staff of design experts will greet you with a smile and ensure that you find exactly what you need to make your home one that you have always dreamed of. Our bedroom furniture store is filled to the brim with beds, bedding, side tables, and more that can completely transform your bedroom. To start creating your bedroom with elegant, yet practical furniture, we invite and encourage you to visit us today. Another element that makes our store different from other bedroom furniture stores is our ability to have a rotating inventory of unique furnishings. We consign designer-inspired bedroom furniture from all over the Coachella Valley to ensure that you not only are getting the best furniture for your space, but also getting it for the best value. If you have unused or lightly used bedroom furniture that you would like to see in our consignment furniture store, click on the button below. You can learn about the many benefits of consigning at Encore and even get started now. 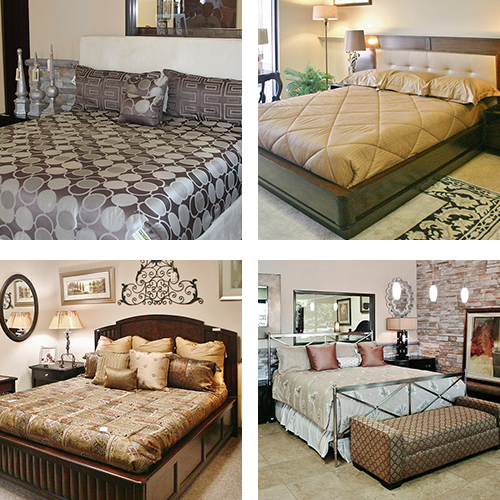 At Encore Consign + Design, we understand that it can be overwhelming to find the right furniture for your bedroom. Our staff of design experts is willing and able to help you create your own personal oasis in-store. If you see items that you like, our designers can stage them in our showroom to directly reflect how they would appear in your home—without making any commitments. To start shopping our beautiful bedroom furniture, backed by a higher level of service, visit us today.